Text by Dirk Walters; art by Mardi Niles. I chose the Pismo clarkia because it grows in the area surrounding Mardi’s home and nowhere else. It grows naturally in about 20 occurrences from the southern Edna Valley, south through the foothills and valleys of the Southern San Luis Range, ending east of Pismo Beach and Arroyo Grande (Huasna Valley). I’m also guessing that few of us have actually seen it. This is because of its very limited range, and that most of its suitable habitat is on private property with limited access. It grows best, like the equally limited SLO County ﬂower (Lupinus ludovicianus), on the essentially sterile sand derived in-situ from the weathered white sandstone found in this area. Another limiting factor is its preference for sites where other plants are sparse. I don’t think it is ever found in large patches, only small patches with a few individual plants. The Pismo clarkia subspecies (or variety) is a federally, State and CNPS listed endangered plant. Why is there confusion between sub-species or variety? This is due to the inconsistency in taxonomic treatment of its species, Clarkia speciosa. Some sources recognize it as a variety and others treat it as a subspecies. I’m siding with the subspecies rank as it has a distinct range separate from the rest of its species, as well as it being recognized as such in THE JEPSON MANUAL, and Hoover’s THE VASCULAR PLANTS OF SLO COUNTY CALIFORNIA. I was taught long ago that subspecies have distinct geographic boundaries that are separated from other sub-categories in its species. Pismo clarkia is the only subspecies that grows west of the Santa Lucia Mountains. The only common name I came up with for its species (Clarkia speciosa) is “red spot clarkia”. I assume it gets this common name because all the other more common & widespread subspecies have a very large prominent reddish-brown basal spot on each of the otherwise uniform red to pink colored petals. In contrast, Pismo clarkia has NO spots, prominent or otherwise. Also Pismo clarkia has two ‘pure’, unblemished colors. The reddish colors are restricted to the upper (distal) three-fourths of the petal. The basal quarter is white. I’ve always assumed the subspecies name (ssp immaculata) is derived from its perceived pure or unspotted colors as well as the ‘pure’ (immaculate) white petal base. 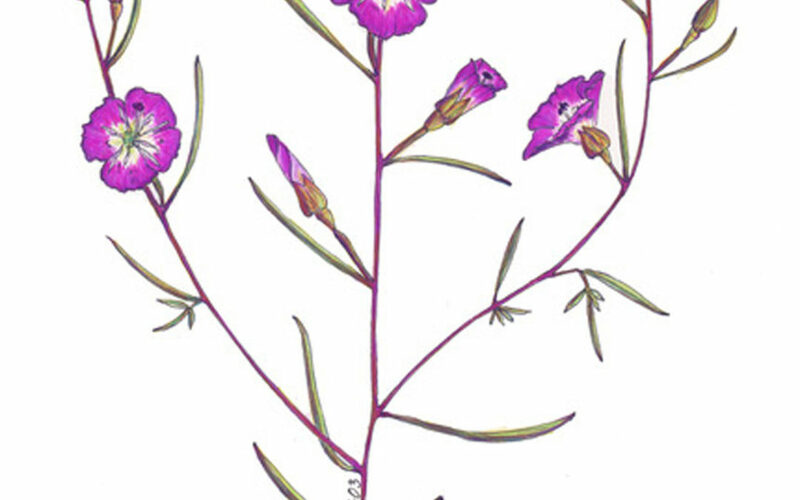 A search of the web indicated that although the Pismo clarkia is federally listed as endangered, it doesn’t have an existing management or restoration plan. I assume that this is due to its small scattered populations generally restricted to mostly individually owned private lands. The only exception is that restrictions have been placed on petroleum extraction activities in Price Canyon. Pismo clarkia is in the Evening primrose or Fuchsia family (Onagraceae), which in our area could better be designated as the Clarkia family. The Clarkia family is one of our more easily recognized families. Unlike most other families it’s characterized by having 4 sepals, 4 petals and 8 stamens. The sepals, petals and stamens are often attached to the far end of a long tube (hypantheum) which arises from the top of the 4 chambered ovary. This places the ovary below the attachment of the other ﬂower parts, making the ovary ‘inferior’. The other family with 4 sepals and 4 petals is the mustard family (Brassicaceae or Cruciferae). However this family usually has 6 stamens and which (along with the sepals and petals) are attached below the 2 chambered ‘superior’ ovary. In our area the Clarkia family is essentially all annual or perennial herbs. Pismo clarkia is an annual. Although some genera have large showy ﬂowers, Pismo clarkia’s ﬂowers are of moderate size. Also Pismo clarkia tends to have weak stems so it tends to sort of spread out laterally instead of growing upright. This also tends to make it less conspicuous. Los Pilitas Nursery’s account of the species notes that it doesn’t compete well with weeds or for that matter other garden ﬂowers, so it is difﬁcult to keep weeds at bay without harming the clarkias. A number of web sites discussed the plant’s seeds but few have them available for sale. Several web sites encourage its use in the garden as a bee plant. A lot of species in the genus, Clarkia, bloom late in spring or early summer. Thus many species of clarkia carry the common names of “farewell-to-spring” or “harbinger-of-summer”. Pismo clarkia also blooms from May into June. Just the other day (early June) I saw a small, beautiful purple clarkia on our property. I didn’t have a field guide with me. Now I need to remember where I saw it and determine if this is what I saw. I live a couple of miles from the Huasna Townsite and have hillsides that are somewhat bare, so it certainly bears investigating.